Miracles We Have Seen is a book of inspiration and optimism, and a compelling glimpse into the lives of physicians—their humanity and determined devotion to their patients and their patients' families. It reminds us that what we don't know or don't understand isn't necessarily cause for fear, and can even be reason for hope. Physicians hold a privileged place in their patients' lives, sharing times of great joy and times of great sorrow. To earn this special role, we prepare for many years. In college, we study the basic sciences: biology, chemistry, physics, and others. We move on to medical school for the clinically relevant sciences, including anatomy, biochemistry, pathology, physiology, microbiology, and more. Outside the lecture halls and labs, we shadow senior physicians on clinical rotations through all the medical specialties: internal medicine, surgery, pediatrics, obstetrics-gynecology, psychiatry, family medicine, neurology. But we're still not finished. After choosing a field for our careers, we undertake a grueling apprenticeship called internship and residency that lasts several years, and we often follow that with further subspecialty training in a fellowship. After all those years learning and training, digesting thousands of textbook pages and medical journal articles, listening to hundreds of lectures, and encountering countless real patients with real diseases and injuries, it would be reasonable to assume doctors understand just about everything there is to understand about the workings of the human body. Yet, in the daily practice of medicine, physicians are often surprised. Two patients with the same diagnosis each have nuances that distinguish them. Illnesses that are usually predictable take unexpected twists and turns. Treatments have unanticipated consequences. Patients and their families amaze us with seemingly impossible inner fortitude and resilience in the face of tragedy and grief. Physicians are accustomed to expect the unexpected, and we are usually well-prepared to respond. But occasionally in the course of caring for our patients, we encounter events that truly stun us: unforgettable occurrences that defy all of our predictions and expectations, far exceeding the wide berth we are trained to allow for surprise. These are events for which there is no clear medical or psychological explanation, or if there is, the explanation itself is extraordinary. When these occur, we are rarely alone in our awe; medicine is a collaborative endeavor, so during these truly confounding and mysterious episodes, we seek advice and consultation from colleagues, specialists, and mentors. And when they, too, are at a loss to explain what we are seeing, the experience often deeply impacts everyone involved. This book tells the stories of medical 'miracles' in the words of leading doctors who witnessed them, physicians at the top of their fields. Contributors to this book include pediatricians, internists, surgeons, family medicine specialists, emergency medicine physicians, obstetricians, psychiatrists, and subspecialists in a wide variety of fields. They include leaders in the bedside care of individual patients, as well as in global health care where entire populations are affected. Among our essayists are dozens of preeminent educators, including deans and department heads, on the faculties of the top university medical schools in the country. All of our essayists also care for patients, spanning the broad clinical spectrum from community practitioners to highly specialized experts at major medical centers. The common thread among us is that we have borne witness to unexplainable, unforgettable, and profoundly unexpected events—medical miracles—in our patients. The first medical miracle I witnessed was as a pediatrics resident-in-training. Two young brothers, ages three and seven, were brought into the emergency room and then the intensive care unit after near-drowning episodes. The recovery of one of the brothers was so unlikely, so astounding, that I was forever imprinted by the experience. This was not the last miracle I would see in my thirty-plus years as a pediatrics specialist. Many of my colleagues would agree that, despite being at the forefront of medicine and science, what we don't understand often exceeds what we do understand. And even when we think we understand, we are frequently proven wrong. The word 'miracle' is often used in religious contexts, and while faith and prayer certainly play an important role in many of our patients' lives, as well as in some of the vignettes in this compilation, this is not a book about religion. I will leave it to the reader to determine what, if any, role those factors play in the outcome of these stories. Rather, this is a book about optimism and inspiration, and the realization that what we don't know or don't understand isn't necessarily cause for fear, and can even be reason for hope. The experience of inviting physicians to contribute essays to this collection has, in and of itself, been enlightening for me. There have been three general categories of responses, all very thoughtful in their own way. Some colleagues knew right away that they hadn't had 'miraculous experiences,' and politely thanked me for asking. A second group said, 'Nothing comes to mind right away, but I'll keep thinking on it and try to come up with something.' With only a few exceptions, those physicians didn't have a belated epiphany despite pondering it. The third group of responses was most exciting for me. These colleagues immediately replied with, 'Oh my goodness! I have an amazing story I've been waiting for the chance to tell.' Not all of us are fortunate enough to encounter unexplained, unexpected, deeply moving and mysterious moments in medicine. But when a medical miracle—physical, emotional, or both—does occur in a physician's career, it's unforgettable, in the forefront of our minds, and ripe for telling. In the telling of the inspirational stories that fill this book, we learn as much about the physicians as about their patients. My editor at HCI Books, Christine Belleris, said it beautifully: Emerging through all of the moving personal testimonials from physicians in this collection is a compelling glimpse into the lives and souls of doctors—their compassion, humanity, and determined devotion to their patients and their patients' families. The other striking observation for me regarding the essays is how many of the events occurred decades earlier—often in the early stages of a physician's training or practice. This is another testament to the powerful impact these experiences have on those witnessing them—unforgettable, still affecting physicians' personal and professional lives. In these decades-old cases, the essayist-physician often recalls the concomitant astonished reactions of his or her senior and supervising physicians, expressed on rounds and in case conferences. It was the astonishment of the senior physicians, highly trained specialists and experienced mentors, as much as the amazement felt by the young physicians, that kept those memories alive all these years. In many cases, physicians describing events occurring years ago noted that those early memories served to give them hope as they encountered new, seemingly hopeless cases in subsequent years. Some contributors wrote that the miracle experience actually directed them in their choice of specialty and has influenced much of their professional decision-making throughout their careers. Others draw on those miraculous moments at times when they themselves feel helpless in the face of adversity and tragedy. Powerful stuff. Another unexpected and quite magical outgrowth of this project has been the reconnections that some of the physician-essayists have now made with the patients and patients' families with whom they shared the miracle years earlier. Either in the course of tracking down the individuals for permission to tell their story, or simply reaching out to learn what has become of them, writing these essays has renewed old bonds. These reconnections have been moving and gratifying for everyone involved—including me, when I've been privileged to be included in the conversation. Several colleagues responded by saying that their memories of patients whose outcomes were unexpectedly bad are more vivid and haunting than those with miraculously good outcomes. That is only natural—we all relive and replay the horrible stories, asking ourselves, What went wrong? and What more could I have done? We must accept the inevitability of bad things occasionally happening to our patients over which we have no more control than we do over mystifyingly good outcomes like some of those described in this book. And among other essays herein, particularly those in the 'Silver Linings' chapter, a mix of good and bad can occur with potent outcomes. Over the course of our careers, we can only hope that the positive results outweigh the negative, sustaining us in the good works we hope to accomplish. Two essay contributors asked me to caution readers that patients' dependence on miracles can be detrimental. While retaining hope in seemingly hopeless situations is emotionally and sometimes even physically healing, hope alone will not cure disease. When proven medical treatments are avail-able and beneficial, but declined in favor of waiting for a miracle, the patient will likely be disappointed. The takeaway message from the essays in this book cannot be to rely solely on a bolt of lightning from above. I received no essays for this collection of miraculous outcomes describing patients who refused proven medical therapy. My grandfather used to tell a joke about the saintly but impoverished old man who prayed and prayed and prayed to win the lottery so he could live a better life in his last years. After years of having his prayers unfulfilled, he finally threw up his hands and asked, 'Dear Lord, I have been a good servant for many years, doing good for others while sacrificing my own needs. Why haven't you granted my wish to win the lottery?' In a booming voice from heaven, the response came, 'My son, you have to buy a ticket!' Hoping for the best outcome possible in a time of medical crisis is natural and uplifting, but you have to buy a ticket—if established and effective therapies are available, don't ignore them while waiting for a miracle. And in the third notable response to my invitation, two colleagues expressed nearly identical sentiments, quoted here with their permission. Although neither had a singularly 'miraculous' patient experience to relate, Nathan Rabinovitch, MD, Professor of Pediatrics at the University of Colorado School of Medicine, said, 'Doing what we do as doctors, and seeing all that can go wrong, I've come to appreciate that every healthy day is a miracle.' And Allan Gibofsky, Professor of Medicine at Weill Cornell Medicine, answered, 'The longer I live, the more convinced I am that every breath, every heartbeat (and yes, even every bowel movement) is itself a miracle. We spend so much of our professional lives as doctors dealing with what is wrong in our patients (and ourselves), that I fear we have become inured to appreciating all that goes right.' Amen to both of them. Thank you for giving audience to the stories we've been waiting to tell about the miracles we've been so fortunate to see. ©2016 Harley A. Rotbart. All rights reserved. 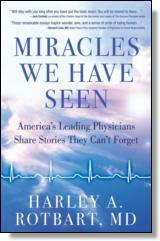 Reprinted from Miracles We Have Seen: America's Leading Physicians Share Stories They Can't Forget. No part of this publication may be reproduced, stored in a retrieval system or transmitted in any form or by any means, without the written permission of the publisher. Publisher: Health Communications, Inc., 3201 SW 15th Street, Deerfield Beach, FL 33442. Harley Rotbart, MD, has been a nationally renowned pediatric specialist, parenting expert, speaker and educator for over 31 years. He is professor and vice chair emeritus of Pediatrics at the University of Colorado School of Medicine and Children's Hospital Colorado. He is the author of numerous medical and scientific publications, and books for lay audiences including No Regrets Parenting and 940 Saturdays. Dr. Rotbart has been named to Best Doctors in America every year since 1996, as well as receiving numerous other national and local awards for research, teaching, and clinical work. He serves on the advisory boards of Parents magazine and Parents.com, and is a consultant to national and local media outlets. He is a regular contributor to Parents and the New York Times.